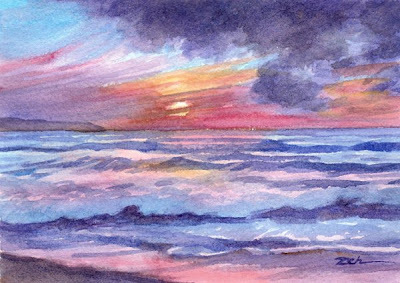 A dramatic sea surges landward under a blazing sky. The sunset has stained the water a deep rose color and a dark cloud passes by as swiftly as the surf rushes in. Sunset Beach has spectacular surf and blazing sunsets. I tried to capture its drama and motion in this painting.